Sunday marked the first race in the Hastings Runners 2019 Championship - and one of the toughest. More than 60 runners took on the Brenda Boyle Pier to Pier race, tackling the 16.4 miles from Eastbourne to Hastings Old Town. The race is run in memory of Brenda, who was a deeply respected member of the club and this was one of her favourite challenges. It was one of the closest races in many years. Darren Barzee had the upper hand from Normans Bay only to be pipped by Dale Saxby in the final mile. Saxby completed the course in an excellent time of one hour, 50 minutes. Barzee’s second place also earned him the top veteran trophy. In the women’s race, new member Katherine Ganly marked her first club run by landing first place, with Debbie Humbles finishing second and winning the veterans’ prize. Seventeen runners completed the shorter eight-mile race from Cooden Beach Hotel to Hastings Old Town. Matt Edmonds was the first male runner home in a brilliant time of 44 minutes and 42 seconds and Claire Thomas successfully defended the women’s title. 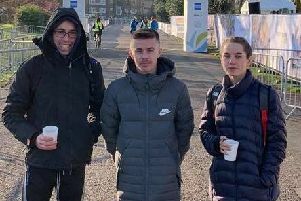 A small group of Hastings Runners took part in The Grand Brighton Half Marathon. It was a particularly successful day for the Burchett family, with husband and wife Paul and Shana both recording PBs with times of 1:27:51 and 2:12:32. Results: Paul Burchett 1:27:51, Bradley Earwalker 1:32:12, Jakub Kucharski 1:45:35, James Mitchell 1:50:41, Darren Pearson 1:52:16, Keith Goodsell 2:00:21, Shana Burchett 2:12:31, Michell Krombholz 2:23:57. Over a slightly shorter distance, eight runners completed The Gunpowder Run in Battle over five miles. Results: Amy Gudgeon 40:21, Suzie Foreman 44:01, Debra Van Aalst 47:40, Emma Dash 48:35, Alice Paine 49:19, Susan Peters 53:38, Linda Beddis 54:22, Alison Tanner 1:00:08.